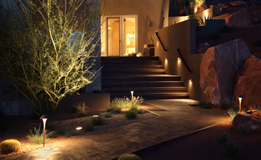 Why Install Low Voltage Landscape Lighting? 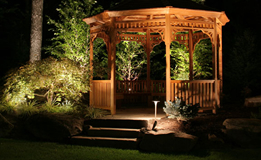 Professionally designed landscape lighting is one the most valuable investments for every upscale homeowner. 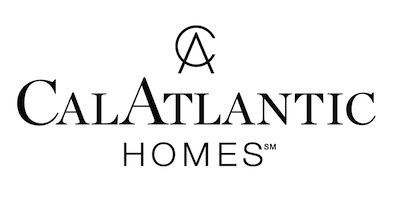 It provides nighttime security and safety; it enables residents to fully utilize their outdoor entertainment areas; and it enhances the nighttime beauty of a residence. The landscape is an extremely corrosive environment. Properties are littered with old landscape lighting fixtures that are corroded, broken, bent, or non-functional. CAST Lighting products are built for this environment; they are the most rugged and reliable landscape lighting products on the market. When you drive onto your property at night, do you see the beauty of your landscape? Does your house glow with a soft and welcoming illuminations. When you relax in the evening on your back deck, are you sitting in a glare-free, subtle and romantic light? Can you enjoy the beauty of the surrounding landscape? If these questions leave you wondering what you might be missing, let me assure you that we can transform your nighttime experience. We can help you to love your home, business and property as much at night as you do during the day. Solid Bronze. Lighting fixtures are constructed of solid sand-cast bronze, the most corrosion-resistant material – better than brass, copper, and aluminum. Even the stakes are solid bronze – unbreakable! Heavy-Duty Stems. Path Light stems are pure copper with a wall thickness many times greater than other brands. Lifetime Warranty. Lifetime warranty on all fixture components – nearly zero returns. Rugged LED’s. CAST Lighting is the only company whose lighting fixtures last longer than their LED’s. Both retrofit LED lamps and integrated LED fixtures are available – all over-engineered for durability and maximum life. Rock-Solid Electrical Components. Sockets and electrical connectors designed to withstand heat, moisture and physical damage. Marine-Grade Wire. All wire used in fixtures, home runs, and transformers is No-Ox Marine-Grade Tin-Coated Wire. This wire maintains excellent conductivity over many decades even when exposed to moisture (superior to all-copper wire). Energy-Efficient Transformers. Transformers contain toroidal cores – about 10% more energy-efficient than EI-laminated cores of other brands. Magnetic breakers, inrush protection, extra-large wire terminals, stainless steel enclosures – just a few of the many features. Simple to Install. The CAST System of Installation is easy to learn, and requires fewer field splices, less time and labor, and more savings in energy costs. 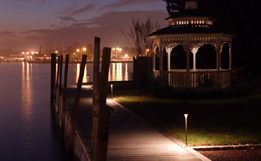 You will never regret investing in one of our landscape lighting systems. We use CAST Lighting fixtures, transformers and other system components. Constructed of solid sand-cast bronze, CAST fixtures are the most durable and well-designed lights available anywhere. We use CAST Lighting because we want your landscape lighting systems to work on day one and for years to come. You can trust us to create the perfect lighting design that fits your property and your lifestyle. We are highly skilled at what we do and are professional in the way we do it.